Zagreb is the capital city, and the cultural, scientific, and governmental center of the Republic of Croatia. It is regarded as the economic center of the Balkans. It is situated between the southern slopes of the Medvednica Mountain and both the northern and southern banks of the Sava River. The city grew out of the union of two medieval communities, Kaptol, an ecclesiastical settlement, on the east and Gradec, a fortress, on the west. Croatia first appeared as a duchy in the seventh century and then as a kingdom in the tenth century. For the next ten centuries, it remained a distinct state with its own ruler (ban) and parliament, but obeyed the kings and emperors of various neighboring powers, primarily Hungary and Austria. Zagreb served as the cultural and political center of Croatia beginning in 925 during the Middle Ages. The period from the fifteenth to the seventeenth centuries was marked by bitter struggles with the Ottoman Empire. In the twentieth century, Austria attempted Germanization of the Croatian homeland. During the Croatian national revival in the nineteenth century, both the pan-Yugoslav and a Croatian independence movements were centered in Zagreb. 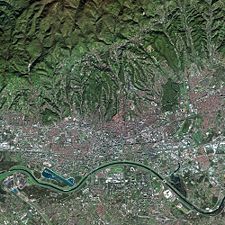 The city's favorable geographic position in the southwestern part of the Pannonian Basin, which extends to the Alpine, Dinaric, Adriatic, and Pannonic regions, provides an excellent hub for traffic between Central Europe and the Adriatic Sea and the Balkans. This, plus the concentration of industry, scientific, and research institutions, and an industrial tradition, underpin its leading economic position in the nation. 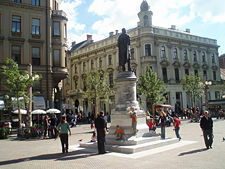 Petar Preradović square, known among residents as "Cvjetni trg" (Flower Square). The name Zagreb most likely derives from the common Slavic word "zagrabiti" (English: to scoop). One legend about the origins of the name involves a thirsty woman who scooped water from Lake Manduševac. Another tells of a Croatian ban who thrust his saber into the ground and ordered his thirsty troops to scrape the soil to get to the water. Zagreb is located between the southern slopes of the Medvednica mountain and both northern and southern banks of the Sava river at an elevation of approximately 400 feet (122 meters) above sea level. The climate of Zagreb is continental, with four separate seasons. Summers are hot and dry, and winters are cold. The average maximum daytime temperature in January is 37°F (3°C), rising to an average maximum of around 77°F (25°C) in July. The end of May, particularly, gets warm, with temperatures rising to the mid-80sºF (30°C) and up. Snowfall is common in winter, from December to March, and rain and fog are common in autumn (October to December). Mean annual precipitation is 35 inches (885 mm). 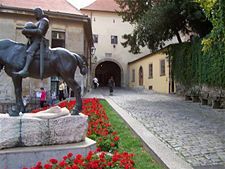 Zagreb’s old town comprises the upper settlement of Gradec, which was fortified in the thirteenth century to defend against the Tatars, and the ecclesiastical settlement of Kaptol, which was fortified in the sixteenth century against Ottoman Turks. These two towns joined in the 19th century and expanded with a rectilinear layout with numerous open squares, parks, and public buildings. Expansion continued from 1860 through the twentieth century. To the north of Medvednica Hill are forests, vineyards, old châteaus, and picturesque villages. Burza square in the 1930s. The city of Zagreb dates to 1094, when the Hungarian King Ladislaus (1040-1095) founded the Zagreb bishopric, a Roman Catholic diocese there. The bishopric known as the canonical settlement Kaptol developed north of the Cathedral, while the fortified settlement Gradec was established on the neighboring hill. Both settlements came under attack from the Tatars in 1242. As a sign of gratitude for offering him a safe haven from the Tatars, the Croatian and Hungarian King Bela IV (1214-1270) made Gradec a free city, fortified the town and gave it a judicial system. King Bela IV deeded Gradec a cannon to seal the agreement with the condition that it be fired every day to avert rust. From January 1, 1877, the cannon is fired daily at Noon from the Lotrščak Tower on Grič to mark midday. The main square of the Gornji Grad is dominated by the Gothic church of St. Mark, that was built at the end of the fourteenth and the beginning of the fifteenth century. A late Baroque bell tower was added later. Fighting ensued between the Zagreb diocese and the free sovereign town of Gradec for land and mills, sometimes also for political reasons. Zagreb was chosen as the seat of the Croatian viceroys in 1621. At the invitation of the Croatian Parliament, the Jesuits came to Zagreb and built the first grammar school, the Saint Catherine's Church and monastery. In 1669, Jesuits founded the Zagreb University where philosophy, theology, and law were taught. Fire and the plague devastated Zagreb during the seventeenth and eighteenth centuries. In 1776, the royal council (government) moved from Varaždin to Zagreb and during the reign of Joseph II (1741-1790), Zagreb became the headquarters of the Varaždin and Karlovac general command. 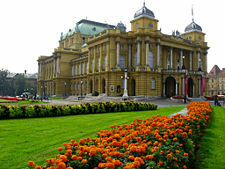 In the nineteenth century, Zagreb was the center of the Croatian National Revival and saw the erection of important cultural and historic institutions. In 1850, the town was united under its first mayor, Janko Kamauf. The first railway line to connect Zagreb with Zidani Most and Sisak was opened in 1862, and in 1863, a gasworks opened there. The Zagreb waterworks was opened in 1878, and the first horse-drawn tramcar was used in 1891. The construction of railway lines enabled the old suburbs to merge into Donji Grad, a district located in the central part of Zagreb, which was characterized by a regular block pattern that prevails in Central European cities. An electric power plant was erected in 1907. Before World War I (1914-1918), the city expanded and neighborhoods like Stara Peščenica in the east and Črnomerec in the west were created. After the war, working-class quarters emerged between the railway and the Sava, whereas the construction of residential quarters on the hills of the southern slopes of Medvednica was completed between the two World Wars. In October 1918, the Croatian Diet, meeting in Zagreb, cut ties with Austria-Hungary and proclaimed the new Kingdom of Serbs, Croats, and Slovenes (later the Kingdom of Yugoslavia). In the 1920s, the population of Zagreb rose by 70 percent—the largest demographic boom in the history of Zagreb. In 1926, the first radio station in the region began broadcasting out of Zagreb, and in 1947, the Zagreb Fair was opened. In World War II (1939-1945), Zagreb became capital of the Nazi puppet Independent State of Croatia, with the Croatian radical right Ustaše in power. The Ustaše enacted racial laws, formed eight concentration camps targeting minority Serbs, Romas and Jewish populations. Yugoslav Partisans under Josip Broz Tito (1892-1980) freed the city in May 1945, and after World War II, Croatia belonged to the six-part Socialist Federative Republic of Yugoslavia. Privately owned factories and estates were nationalized, and the economy was based on a type of planned market socialism. In Zagreb, the area between the railway and the Sava River underwent a construction boom. After the mid-1950s, construction of new residential areas south of the Sava began, resulting in Novi Zagreb (New Zagreb). The city also expanded westward and eastward, incorporating Dubrava, Podsused, Jarun, Blato, and other settlements. During the 1991-1995 Croatian War of Independence, the city was the scene of some sporadic fighting surrounding its JNA army barracks, but escaped major damage. In May 1995, it was targeted by Serb rocket artillery in the Zagreb rocket attack that killed seven civilians. Croatia is a parliamentary democracy in which the president, who is chief of state, is elected by popular vote for a five-year term, and is eligible for a second term. The prime minister is head of government, who, as leader of the majority party, is appointed by the president and approved by the assembly. The unicameral assembly, or Sabor, comprises 153 members elected from party lists by popular vote to serve four-year terms. The city of Zagreb, as the capital of Croatia, has special status and is the administrative center of Zagreb city and Zagreb county. Croatia has 20 counties (županijas). 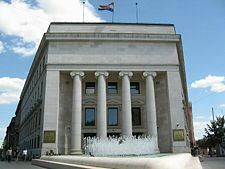 Zagreb city administration comprises the directly elected 51-member city assembly, as well as the 11-member executive body, elected by the assembly. The mayor is the head of city government and has two deputies. The city administrative bodies comprises 12 city offices, three city bureaus and three city services. They are responsible to the mayor and the city government. Local government is organized in 17 city districts represented by City District Councils. Once one of the wealthiest of the Yugoslav republics, Croatia's economy suffered during the 1991-95 war as output collapsed and the country missed the early waves of investment in Central and Eastern Europe that followed the fall of the Berlin Wall. Since 2000, Croatia's economic fortunes have begun to improve, led by a rebound in tourism and credit-driven consumer spending. A high unemployment rate (of 11.8 percent in 2007), a growing trade deficit, and uneven regional development pose challenges. Zagreb is Croatia’s main industrial center, an international trade and business center, as well as a transport crossroad of Central and East Europe. Companies in Zagreb created 52 percent of total turnover and 60 percent of total profit of Croatia in 2006 as well as 37 percent of Croatian exports. The city of Zagreb has the highest nominal GDP per capita in Croatia of US$14,480, compared to the 2004 Croatian average of US$8024. In 2006, the average unemployment rate in Zagreb was around 8.6 percent, compared with a national rate of around 11 percent. About 34 percent of companies in Croatia have headquarters in Zagreb, and 38.4 percent of Croatian workforce works in Zagreb, including almost all banks, utility and public transport companies. Local reserves of petroleum and natural gas are the basis of the city's chemical industry. Other products include heavy machinery, rolling stock, electric machinery, pharmaceuticals, cement, newsprint, footwear, textiles, as well as food and drink processing. Zagreb is an important tourist center, not only in terms of passengers traveling from Western and Central Europe to the Adriatic Sea, but also as a travel destination itself. Since the end of the war (1991-1995), it has attracted approximately half a million visitors annually, mainly from Austria, Germany and Italy. However, the city has even greater potential as many tourists who visit Croatia skip Zagreb in order to visit the beaches along the Croatian Adriatic coast and old historic Renaissance cities such as Dubrovnik, Split, and Zadar. Zagreb is an important hub of roads and rail lines from Europe to the Adriatic Sea and the Balkans. 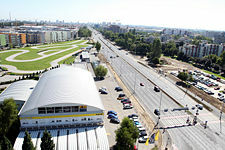 The city has an avenue network with several main arteries up to 10 lanes wide, and the Zagreb bypass, a congested four-lane highway encircling most of the city. There is much congestion in the city center during the rush hour and a daytime parking problem. As of 2007, Zagreb had seven road traffic bridges across the river Sava. Public transport in the inner parts of the city is covered by trams, and the outer suburbs are linked with buses. Zagreb Airport is the main Croatian international airport, and is located in the suburb of Pleso, a 20 km drive southeast of Zagreb, while Lučko is a second, smaller airport, which is home to sports airplanes, a Croatian special police unit, and a military helicopter airbase. 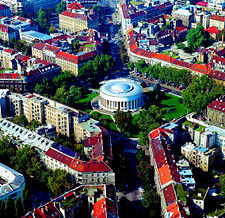 Zagreb is the only Croatian city whose metropolitan population exceeds one million people. There were 1,088,841 people in the Zagreb metropolitan area in 2006, which included the smaller cities of Samobor, Velika Gorica and Zaprešić. A total of 784,900 lived in the city proper in 2006, according to government estimates. Most citizens are Croats, making up 91.94 percent of the city's population (2001 census). The same census records 40,066 residents belonging to ethnic minorities. These comprise: Serbs (2.41 percent), Bosniaks (0.80 percent), Muslims by nationality (0.52 percent), Albanians (0.43 percent), Slovenes (0.41 percent), Roma (0.25 percent), Montenegrins (0.17 percent), Macedonians (0.17 percent), together with other smaller minor ethnic communities. Languages spoken include Croatian 96.1 percent, Serbian 1 percent, other and undesignated 2.9 percent (including Italian, Hungarian, Czech, Slovak, and German). 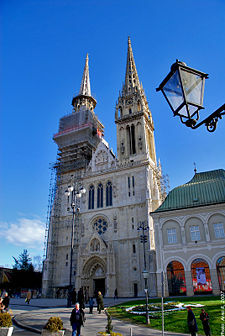 The Archdiocese of Zagreb is a metropolitan see of the Catholic Church in Croatia, serving as its religious center. The city is also the Episcopal see of the Metropolitan of Zagreb, and Islamic religious organization of Croatia has the see in Zagreb. The 2001 census shows that Roman Catholics make up 87.8 percent of the population, Orthodox 4.4 percent, other Christian 0.4 percent, Muslim 1.3 percent, other and unspecified 0.9 percent, none 5.2 percent. 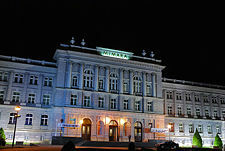 The University of Zagreb, founded in 1669, is one of five public higher education institutions and nine private professional higher education schools in the city. The Zagreb Classical Gymnasium (Klasična gimnazija) was founded by the Society of Jesus in 1607. The school was bombed on May 2, 1995. Zagreb hosts Zagrebfest, the oldest Croatian pop-music festival, as well as of several traditional international sports events and tournaments. The Day of the City of Zagreb on November 16, is celebrated every year with special festivities, especially on the Jarun lake near the southwestern section of the city. The Recreational Sports Center Jarun, situated on Jarun Lake, has shingle beaches, a world-class regatta course, a jogging lane around the lake, several restaurants, night clubs and a discotheque. Dom Sportova, a sport center in northern Trešnjevka, used for basketball, handball, volleyball, hockey, gymnastics, and tennis, features six halls—the largest two can accommodate 12,000 and 4,000 people, respectively. Sports Park Mladost, situated on the embankment of the Sava River, has an Olympic-size swimming pool, smaller indoor and outdoor swimming pools, a sunbathing terrace, 16 tennis courts as well as basketball, volleyball, handball, football and field hockey courts. A volleyball sports hall is within the park. The Sports and Recreational Center Šalata has a big tennis court and eight smaller ones, as well as swimming pools, basketball courts, football fields, a gym and fitness center, and a four-lane bowling alley. Zagreb Cathedral on Kaptol, which is arguably the most famous building in Zagreb. Construction began in 1093, Tatars destroyed it in 1242, it was fortified at the end of the 15th century, and damaged by earthquake in 1880. Saint Mark’s Church, which was built as early as the 13th century, and radically reconstructed in the second half of the 14th century. The Town Hall, at the corner of Saint Mark's Square, was the seat of the city administration in medieval times. 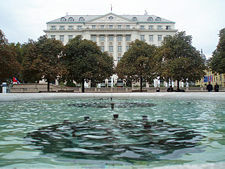 The building has gone through a number of alterations, and today is still used for meetings of the Zagreb City Council. The Strossmayer's Old Masters Gallery, which holds European paintings from the fourteenth to nineteenth centuries. 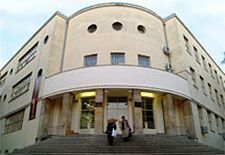 The Archaeological Museum, which has nearly 400,000 artifacts and monuments, including the Zagreb mummy and bandages with the oldest Etruscan inscription in the world (Liber Linteus Zagrabiensis). The Croatian Natural History Museum, which holds the remains, stone weapons, and tools of prehistoric Neanderthal Krapina man. The Ethnographic Museum, which holds about 80,000 items covering the ethnographic heritage of Croatia, classified in the three cultural zones: the Pannonian, Dinaric and Adriatic. Old Medvedgrad, which is a restored medieval village built in the thirteenth century, and represents a special attraction of Medvednica hill. Zagreb has a rich heritage that will continue to attract increasing numbers of tourists. As the nation’s main industrial center, an international trade and business center, as well as a transport crossroad of Central and Eastern Europe, Zagreb is well placed to continue as Croatia’s economic power house, especially as the troubled years of the break-up of Yugoslavia recede further into history. 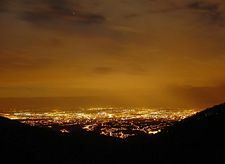 ↑ City of zagreb 2006. City of Zagreb, Statistics Department. Retrieved January 25, 2008. ↑ Statistički ljetopis Grada Zagreba 2007. Retrieved June 16, 2012. ↑ Croatian Census 2011 First Results Retrieved June 16, 2012. ↑ Croatian Census 2011 First Results, City of Zagreb - Population by districts Retrieved June 16, 2012. ↑ (Croatian) Croatian Chamber of Commerce, Zagreb Chamber of Commerce, Economic Profile of Zagreb Chamber of Commerce. Retrieved October 2, 2008. ↑ Croatian Bureau of Statistics. February 22, 2007. Gross Domestic Product for Republic of Croatia and Counties, 2004. Retrieved October 2, 2008. ↑ (Croatian) City of Zagreb, City Institute for Urban Planning, Statistics Department, October 26, 2007, Vital Statistics in 2006. Retrieved October 2, 2008. ↑ Republic of Croatia—Central Bureau of Statistics, Population by Ethnicity, by Towns/Municipalities, Census 2001. Retrieved October 2, 2008. Blau, Eve, Ivan Rupnik, and Ivan Rogić Nehajev. 2007. Project Zagreb: Transition as Condition, Strategy, Practice. Barcelona: Actar D. ISBN 9788496540576. CitySpots. 2007. Zagreb. Peterborough: Thomas Cook. ISBN 9781841577777. Hawkesworth, Celia. 2008. Zagreb: A Cultural History. Oxford: Oxford University Press. ISBN 9780195327984. Milčec, Zvonimir. 2007. Zagreb Revisited. Zagreb: Ambrozija. ISBN 9789532016710. Nazor, Ante. 2005. Zagreb. Cultural and Historical Heritage. Zagreb: Turisticka naklada d.o.o. ISBN 9789532152203. Republic of Croatia, Bureau of Statistics. Population by Ethnicity. Retrieved September 23, 2008. World Fact Book. 2008. Croatia. Retrieved September 17, 2008. This page was last modified on 24 October 2016, at 16:46.